This recipe is merely a proportional guide to making Plum Cordial. I made a large batch in February, using 7lb of Plums from the freezer. The Sugar amount is merely a rough guide, the Plums i used were sweet to start with. Put the Plums & Water in a large pan. Bring gently to the boil, then turn down and simmer for 30 minutes. Strain into another large pan (or bucket). Add the Sugar, stir to dissolve. Gently bring it back to the boil and simmer for a further 10 minutes. Thanks for cordial recipes. 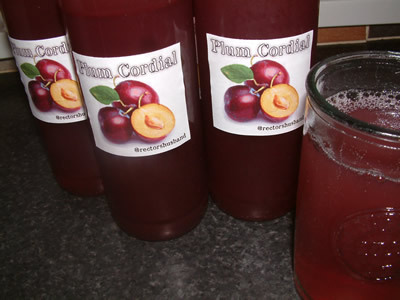 Hope to make plum cordial at weekend. Just made up 3 pints of plum and added 2 pomegranates to the mix. Hope it works! If it does, care to trade for a bottle of Damson Cordial? That’s a deal! Kids love the Damson as well but no chest freezer yet to store last years fruit, it’s a long time to Autumn. Will drop out a bottle tonight.